You Are Cordially Invited to Champagne Sundays! I love Sunday brunch. Not quite breakfast, yet not quite lunch, the breakfast and drink choices are endless. While I usually try different cocktails, I almost always select a waffle for my meal. Any city has numerous restaurant selections for Sunday brunch, but sometimes it’s just as nice to prepare brunch at home. In my home waffles are still the number one choice. 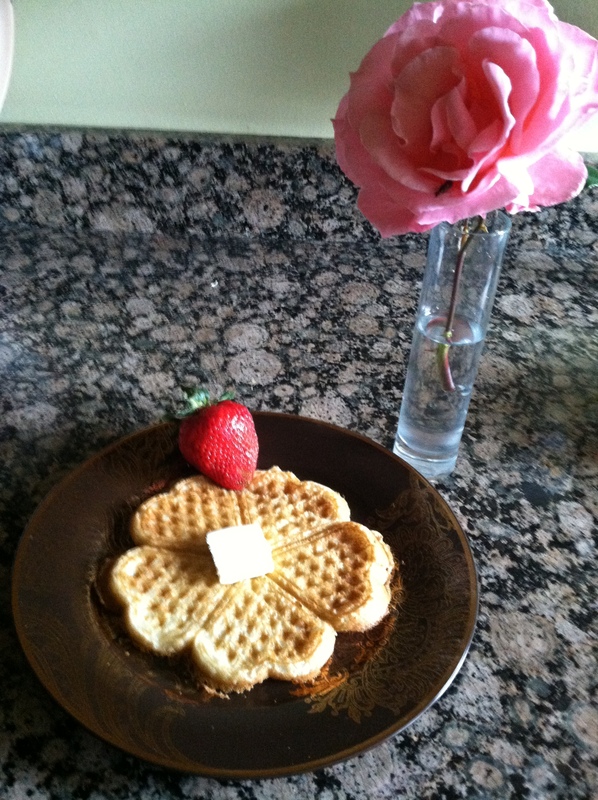 However, we make them a little special by using our Heart-Shaped Waffle Maker from Kalorik. Not only do the waffle cooks evenly and taste great, they present wonderfully! Image: Brunch this morning at the Pretty Domestic home. Hmmm, but what drink to serve? At most restaurants Mimosas are the brunch drink de rigueur, but there are so many options if you are preparing brunch at home. With Peach season quickly approaching (June/July), why not try a Peach Prosecco to accompany your Sunday brunch. Garnish with a Peach wedge. Check back next week for a new “Champagne Sundays” recipe! Cheers!